An extraordinary new film about a lesser-known heroism of WWII sees its premiere this week. Within the diseased squalor of the Warsaw Ghetto a secret society of intellectuals carried out an extraordinary form of resistance – not with guns and grenades but with pens and paper to document the horrors of everyday life. Together, the 60-member group calling itself Oneg Shabbat (Joys of the Sabbath) secretly recorded everyday life in the ghetto, providing an eye-witness account of German Nazi atrocities. Led by a social worker and historian called Emanuel Ringelblum, the group collated over 35,000 pages of memoirs in the form of diaries, photos, letters as well as newspapers which they buried in metal boxes and milk churns . The Ringelblum Archive as it became known survived the destruction of the ghetto and after the war it was found buried under the rubble of what remained of Warsaw in 10 metal cases and two metal milk churns . The extraordinary archive and the activities of Ringelblum and his Oneg Shabbat group have now been turned into a major film with Adrien Brody providing the voice of Ringelblum and directed by Roberta Grossman. Seeing its premiere this Saturday July 21st at the 38th San Francisco Jewish Film Festival it tells the incredible story of people who tried, and achieved, to preserve an eye-witness testimony of life and death during the Holocaust. The basis of the newest Grossman’s film was the book written by an American historian, Samuel Kassow, entitled “Who Will Write Our History? Rediscovering a Hidden Archive From the Warsaw Ghetto.” The book, published in 2007, was the first English-language in-depth academic publication to go into detail about the Archive, and the man behind it. Emanuel Ringelblum was a Jewish-Polish historian, political activist and social worker. Born on November 21, 1900 in a small town in Galicia, he moved to Warsaw in 1920. First, he graduated from Warsaw University, and later (1927) wrote his doctoral thesis on the history of the Jews of Warsaw during the Middle Ages. Apart from academic work, he was strongly involved in social work, helping, for example, Polish Jews expelled from Germany in 1938 and 1939. When Nazi Germany invaded Poland in 1939, following occupation they began setting up Jewish ghettos. When the Warsaw Ghetto was created, Ringelblum and his family, along with all of the Warsaw Jews, were sent there where he began making notes on everyday atrocities he witnessed and realized he need more people involved, thus was born the Oneg Shabbat group. The group met every Saturday to discuss the progress of their work - diaries, journalistic articles, jokes, song lyrics, drawings, photos, wall posters, German pronouncements, official and underground newspapers, even simple labels on Ghetto goods. It was a modern-day Noah's Ark of documents about life, memories and personal histories, in a place where all of them were threatened with extermination. Of the 60 members, all but three were executed. One of the survivors was Rachel Auerbach (played in the film by Jowita Budnik). 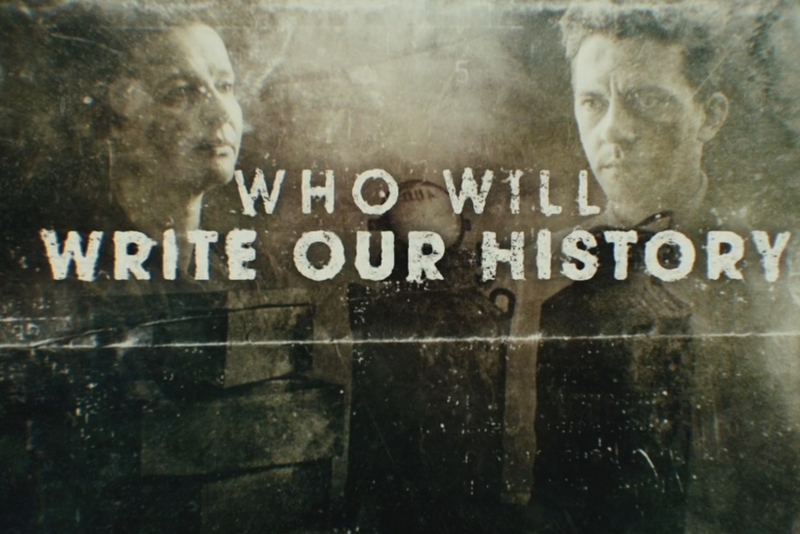 Who Will Write Our History - Theatrical Trailer from Katahdin Productions on Vimeo. An extremely talented Polish Jew, she began her professional career, as a journalist, essayist and writer in Lviv. Later, in 1933, she went to Warsaw and became a regular contributor to the principal Yiddish and Polish newspapers of the day writing about literature, education, psychology, folklore, art, linguistics and theatre. Her special interest was Yiddish and Polish women authors. Later, during the German Nazi occupation, she ran a soup kitchen in the Warsaw Ghetto and was a key contributor to Oneg Shabbat. And it was Rachel Auerbach, who only one year after the end of WWII, when the city of Warsaw was still nothing more than a sea of debris, started the search for lost the Ringelblum Archive. The majority of the documents (about 35,000 pages) were found, preserved, and today they are all carefully housed at the Jewish Historical Institute in Warsaw. The remaining archive is believed to be buried under what is now the Chinese Embassy in Warsaw. In 1999 the archive was listed on UNESCO’s Memory of the World Register. Commenting on Ringelblum’s legacy, Yehuda Bauer from Yad Vashem said: “There are two forms of resistance: armed resistance and unarmed resistance. Historian Emanuel Ringelblum led a group of intellectuals who risked their lives in a resistance mission to preserve Jewish memory in the face of total annihilation. Ringelblum may or may not have not believed in God, but he believed deeply in the Jewish people and in the importance of Jewish history." The film sees its premiere on Saturday July 21st.